If we didn’t need any more reminders that we’re hurtling towards the future faster and more furious than ever, we nonetheless got not one but two this week with Elon Musk’s mindblowing new Tesla semi-truck and updated roadster. What, you might be asking, does this have to do with Canadian discount brokerages? Well, simply put, Tesla’s re-imagining of the trucking industry is a reminder that no industry is safe from disruption by technology, and that includes the online trading industry. In this edition of the roundup, we look at the recently published and highly-anticipated year in review series as told by the Canadian online brokerages themselves. From there, we’ll review the latest discount brokerage deal to cross the wires as well as some interesting opinions by one online brokerage CEO on the perils of bitcoin trading. Finally, we wrap up with the results of our scans of social media and the DIY investor forums for investor chatter. Earlier this week we published our highly anticipated Canadian online brokerage ‘year in review and preview to 2018.’ This series, which featured participation from leaders from 9 of Canada’s online brokerages, provides a unique window into the performance and priorities for each firm in 2017 as well as a sneak peek into what DIY investors can expect for 2018. We were genuinely excited by the responses and participation from Canada’s online brokerages. Not only did they chronicle some of the major milestones and accomplishments for 2017, we also were able to see some trends emerging across the responses we received, and have summarized several of them below. One of the first and clearest trends that emerged across Canada’s online brokerages for 2017 was being able to harness web and trading technology and, in turn, improve user experience. As financial services firms, Canada’s online brokerages face similar challenges that other financial service providers do in that they require constant responsiveness to changes in technology and consumer technology preferences. This past week, for example, there was news that BMO has created a voice-enable service that pairs with Amazon’s Alexa and also that RBC is field testing a robo-advisor. Of course, as features and services evolve, online brokerages may be able to deliver more value to DIY investors without increasing commission pricing. The fierce competition among Canada’s discount brokerages mean that everyone is vigilant about enhancing perceived value to their clients by using technology. This past year, for example, saw firms such as National Bank Direct Brokerage drop commission fees on all ETFs or other firms, such as RBC Direct Investing and Credential Direct, launch personal-finance focused content to their clients. Another important theme that emerged from the responses from Canada’s online brokerages about 2017 was that the trading experience is being fine-tuned across the board. There are surprisingly many moving parts to the investing/trading process and the entire cycle from how trades are placed to managing and monitoring the status of open orders to keeping track of the documentation associated with an online trading account has seen improvements. BMO InvestorLine, for example, made accessing tax documentation smoother and both Questrade and TD Direct Investing improved the options trading capabilities for clients interested in these products. In addition to the look back on 2017, several online brokerages provided a glimpse of what’s in store for DIY investors in 2018. As we reported last week, Qtrade Investor actually published information on many of the enhancements they have planned or have just deployed, including removing account deposit minimums and new features for tracking contributions to registered accounts. However, they are not alone. Other online brokerages, such as NBDB and TD Direct Investing are forecasting improvements to account opening processes, while on the active trader side of the spectrum, firms such as Interactive Brokers Canada and TD Direct Investing have upgrades planned to account and trade management planned for the near future. Check out the full list of online brokerages in the year in review article here or by clicking one of the links below. Just in time for the Black Friday rush, one more Canadian online brokerage has released its own cash-back offer. 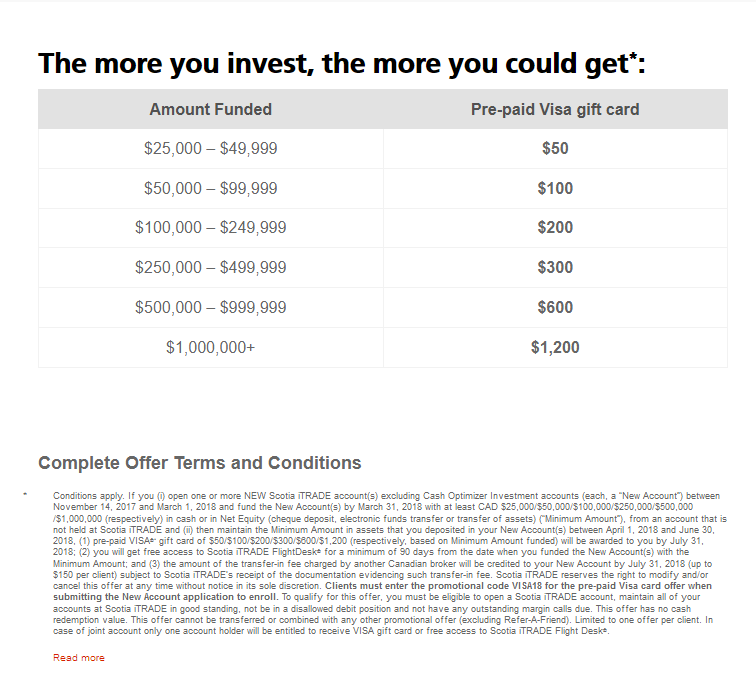 This week, Scotia iTRADE rejoined the discount brokerage deals and promotions pool in a significant way by launching their latest offer: a tiered pre-paid Visa card for opening a new account. As with previous promotions, this is a tiered offer that provides a cash back amount in line with the amount of assets deposited. Qualifying deposits start at $25,000 which will land a $50 pre-paid gift card and go up to $1200 for deposits of $1,000,000 or more. Check out the deals section for more details.. The new world of online trading has expanded to include cryptocurrency. While still highly controversial, there have been recent developments that show signs that cryptocurrency trading is going mainstream – including the clearing of futures of bitcoin. This past week, the founder and CEO of Interactive Brokers, Thomas Peterffy, took the bold step of issuing a stern warning to regulators and financial market participants about the potential systemic risk of clearing trades of bitcoin futures. The ‘father of high-speed trading’ just put bitcoin on blast from CNBC. One especially interesting nugget that he provided in the interview was that Interactive Brokers would be open to enabling clients trade bitcoin and even possibly bitcoin futures through the appropriate venue. The key takeaway, however, is that there needs to be a separation between bitcoin futures clearing organizations and organizations that also clear regulated securities. Check out the interview he gave on CNBC above and read the notice he placed in the Wall Street Journal – it definitely helps put some the recent enthusiasm in bitcoin into perspective. From outages to wait times, most of this week’s tweets provide an interesting look into what happens when things go off the rails at Canadian online brokerages. Of course, there are a handful of positive ones in the bunch too. Mentioned by Canadian DIY investors were BMO Investorline, CIBC Investor‘s Edge, Questrade, RBC Direct Investing, Scotia iTRADE, and TD Direct Investing. TD Direct Investing’s e-Series funds are undoubtedly a hit with DIY investors. In this post from reddit’s personal finance Canada section, one reader was curious about how to optimize participating in the e-Series but minimizing the banking costs. Worth a read. One of the great things about being young in 2018, aside from Snapchat and high-speed internet, is that many online brokerages have pricing or pricing breaks for younger investors. Find out what tips this young investor on reddit’s personal finance Canada section received when inquiring about the best online brokerage for young investors. With all this talk of fantastical electric vehicles, it seems fitting to celebrate the weekend by recharging for the week ahead. Of course, traders will almost inevitably be looking for ways to ‘buy low’ for the upcoming Black Friday, so best of luck hunting deals inside of and outside of the stock (or cryptocurrency) market. Have a great weekend!